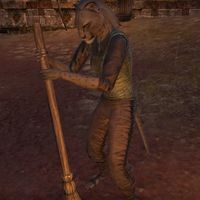 Dehdri is a Khajiit gatherer who can be found in S'ren-ja. She can be found mucking out the stables behind Kalari's House. She cannot be spoken to. This page was last modified on 7 December 2018, at 20:48.